A few months ago (aka…summer…) some friends of ours had their 3rd baby, and I signed up to make them a meal and deliver it to their house, so they didn’t have to cook. A bunch of people signed up, I believe 3 nights a week for several weeks, to give mama a break while caring for an infant plus two older kids, while dad is at work. It was fun to meet her baby and treat her to a nice and hot dinner. They had requested low calorie and low carb, which is hard to find in easily-transported dinners (soups, stews, spaghetti, casseroles, etc. 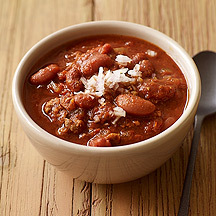 ), but then I found this beef and bean chili from Weight Watchers that I had been meaning to try and it seemed perfect! I made a double batch so that I could have dinner for my husband and I, as well. For their batch, I used the canned tomatoes as-is, but I blended the tomatoes for my husband and I’s batch (I HATTTTTE tomato chunks, which I’m sure everyone is well aware). It was so good! And you can’t even tell that it’s “healthy.” I have found that some WW recipes are touch and go – some are just bland and flavourless, and then some are really spectacular. Oh, and we STILL have cooked beans left over in the freezer from this…a bag of dried beans makes a lot. And by a lot, I mean A LOT. I did not get a chance to snap a picture of my own creation, therefore the photo used below is not my own, it is owned by Weight Watchers was obtained from their website. -Coat a large stockpot with cooking spray and set over medium-high heat. Add beef and cook until browned, breaking up meat as it cooks, about 5 minutes. Remove beef from pot and set aside. -Add oil to the pot and set over medium-high heat. When oil begins to shimmer, add onion, celery, garlic and jalapeño. Sauté until tender, about 4 minutes. -Add reserved beef, chili powder, cumin, oregano, bay leaves, salt and red pepper flakes, and stir to coat vegetables and beef with spices. Add tomatoes, broth, tomato sauce and beans, then bring to a boil. Reduce heat to low and simmer, partially covered, for about 30 minutes. -To serve, discard bay leaves, and ladle chili into bowls and top with chopped shallots (I omitted the shallots). Note: According to the WW website, 1 heaping cup is 5 points. Sweet! !